Hita Harivamsa Goswami, a 16th Century Vaisnava Saint, was the founder of the Radhavallabha Vaishnava sect. It is believed by the sect that Hita Harivamsa Goswamiji was the incarnation of flute (vamsi) of Bhagavan Sri Krishna. He was born in 1502 AD at Baad Village near Mathura. From a very young age, Harivamsa Goswami Ji was attracted to the leelas of Sri Krishna. Such was his intense devotion that he composed a devotional song title ‘Sri Radhasudha Nidhi’ in his childhood. Numerous miracles are associated with the saint and he is believed to have had many visions of Radha and Krishna from early childhood. There is a belief that Radha Rani herself imparted the Guru mantra to Harivamsa Goswami Ji. As per the belief of Radhavallabha Vaishnava sect, Radha is the main deity. 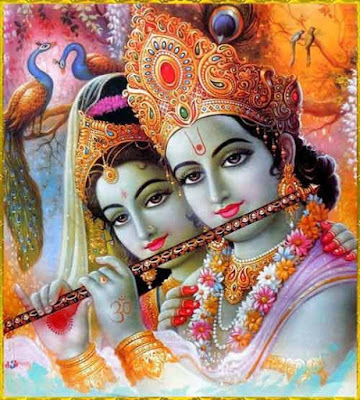 A devotee can obtain the blessing of Bhagavan Sri Krishna only when Radha is pleased. Once, while playing, Harivamsa Goswami Ji fell into an old well. His parents, family members and people of village soon discovered a divine light emerging from the old well. To their delight, they saw the young boy coming out of the well carrying a murti of Bhagavan Sri Krishna. The murti was given the name Navrangi Lalji and it is seen at Devband Temple in Saharanpur District, Uttar Pradesh. Four sacred place associated with Vishnavism were discovered by the saint – Seva Kunj, Raas Mandal, Vanshivat and Mansarovar. Harivamsa Goswami Ji merged in Bhagavan with the blessing of Radha in 1552 AD.